Amongst the sea of AirPlay enabled audio speakers and docks, the European high-end sound systems makers Libartone has announced a few of its own gorgeous and well designed AirPlay enabled wireless speakers with simplistic Scandinavian design and made from hand picked materials that include Italian cashmere, wool, satin plated chrome and wood. 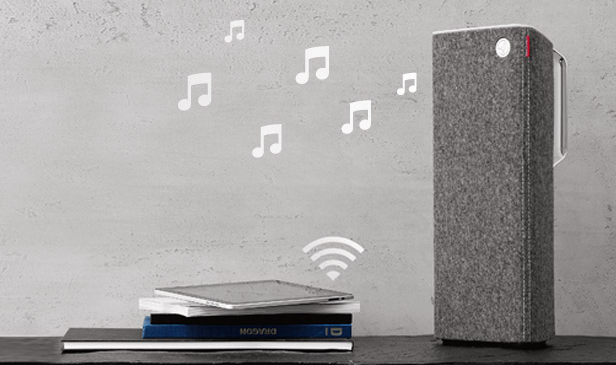 Libratone is releasing both of its AirPlay boasting Lounge and Live wireless speakers in the US for all to enjoy state-of-the-art sound and stream their music thru iTunes on a Mac or PC as well as any iOS device over a WiFi network. The Libratone Lounge is geared towards living in your living room space and can be hooked up to your TV for a 360 degree Hi-Fi sound experience. Libratone's smaller and more portable Live speaker also utilizes Libratone's FullRoom technology found in the Lounge speaker to output sound in a 360 degree angle. Both Live and Lounge are available now in a variety of colors for $699 and $1,299, while you should expect to drop more for the cashmere models.